Amid the hellfire and rapid gunfire of the latest Doom title, a handful of treats lie waiting to be discovered. Fleeting allusions to films and other video games can be spotted during gameplay – Terminator 2, Skyrim, the Fallout series – while secret levers unlock hidden areas modelled after the original game. These Easter eggs are not limited to the visuals, though. As glimpsed in a behind-the-scenes video with Mick Gordon, Doom’s composer, its soundtrack includes gifts of its own. 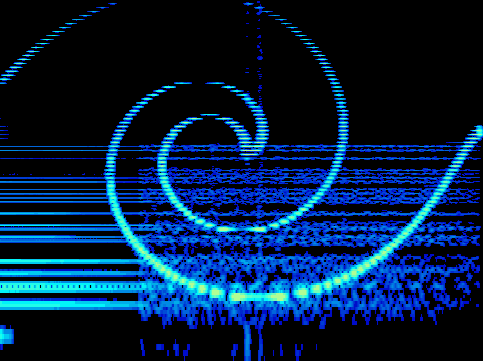 When the spectrum of frequencies heard on one composition, ‘Cyberdemon’, is graphically represented (see below), pentagrams and triple sixes emerge from the mix – both magnifying and lightly mocking the game’s demonic backdrop. Nor is the act of hiding visual images in music without precedents, most often to be uncovered through spectral analysis. Sound spectrograms plot the degree of amplitude for each frequency heard in a given range (y-axis), against time (x-axis). By carefully reverse-engineering the frequencies used, it is possible for a composer to create a picture out of them, to later be found by others with the right software. Using this method, Aphex Twin’s ‘Windowlicker’ can be seen to contain a spiral, while its B-side – known unofficially as ‘[Equation]’ – features Richard D. James’ trademark grin. Venetian Snares’ ‘Look’ offers a cuddlier example, in a reference to the album’s central theme: Songs About My Cats. Whether through the convenient glimpse of Mick Gordon’s computer screen, or the attention-grabbing mathematical symbols in the unabridged title of ‘[Equation]’, each composer offers hints that their audience should dig further into the music. Few listeners may think to run a spectral analysis, but it only takes one curious person to follow the clues and release the images. Once online, they will quickly circulate within the fan community. The tracks discussed here sound the way they do in order to achieve a visual result, as the title of ‘Look’ makes explicit. This need not mean that the sonic outcome was ignored, but rather that sight and sound were considered together. ‘Cyberdemon’, in which five-pointed stars and the number of the beast are sonically rendered as an ominous four-beat crotchet crunch, is a case in point. It demonstrates how a soundtrack can contribute to video games by performing functions that are not solely led by narrative, aesthetic or mood. As with compositions for film, the stage or multimedia installations, video game music can add layers of meaning, offer alternative perspectives, and provide new content. A better example still is Disasterpiece’s soundtrack for Fez, a game that starts as a seemingly straightforward puzzle platformer but morphs – if you have the patience – into a complex cryptographic challenge. Numerical systems must be understood; tomes must be translated; blinking stars must be codified into binary. Disasterpiece’s music harbours similarly enigmatic secrets. The corresponding spectrograms reveal an array of images, from Neil Armstrong’s first lunar footstep, to Salvador Dali’s Crucifixion. One track even includes a QR code that, when scanned, leads to a string of ten dates. The meaning remains unknown, an unsolved riddle, and has become an emblem – one of many – of Fez’s fiendish demands. Max Steiner, the Hollywood Golden Age composer, once claimed that film music was not a platform on which to “show off”. Instead, he argued, composers should subordinate themselves to the visual experience. Video games are still yet to shake off that mentality entirely, but Doom and Fez offer proof that there is plenty of room for compositional cleverness. Game designers are becoming increasingly aware of the opportunities that soundtracks can offer, from contributing to the title’s lore, to pushing at the boundaries of what ‘gameplay’ can mean. Ludomusicology — the study of game soundtracks — is a growing field, and with good reason. The future of video game music promises innovation and playful inventiveness: more Doom than gloom. An earlier version of this article can be read on the author’s blog, The Draft Man’s Contract.